The health benefits attributed to cocoa beans come from the high levels of alkaloids they contain. This is in addition to many other phytonutrients, vitamins and minerals including Vitamins, A, B1, B2, D and E; as well as potassium, magnesium, copper and iron. So far, so good. Now for the bad news, which is that alkaloids are extremely bitter. To make the end product more palatable – and so less bitter – these are removed during processing. Ingredients: Milk, sugar, cocoa butter, cocoa mass, vegetable fats (palm oil, shea butter), emulsifiers, flavourings. Nutritional value per 100g: Energy 530 Kcal (a whopping ¼ of the recommended calorie intake for women), 56% sugar, 30% fat, 7% protein. Simply moving over to a better quality dark chocolate means you can still enjoy your “chocolate fix” and get the health benefits too. By better quality, we mean an organic and fairtrade product. Not only does this mean that it’s been produced without all those nasty chemicals; but the workers have been treated well and paid a living wage. This in in stark comparison to many of the cheaper products, which rely on child labour to keep the costs down, alongside intensive use of chemicals to maximise the amount produced. Reduced blood pressure, with a reduced risk of heart attacks and strokes. Reduced risk of colon cancer, due to the polyphenols found in cocoa. The fat found in cocoa doesn’t raise cholesterol. In addition cocoa also contains oleic acid, a fatty acid also found in olive oil, which helps to prevent heart disease as well as promoting antioxidant activity. The lower levels of sugar found in dark chocolate prevent the swings in blood sugar associated with its sugar laden cousins. This helps maintain a more stable blood sugar which helps prevent diabetes and obesity. We all know that chocolate helps improve our mood (!) 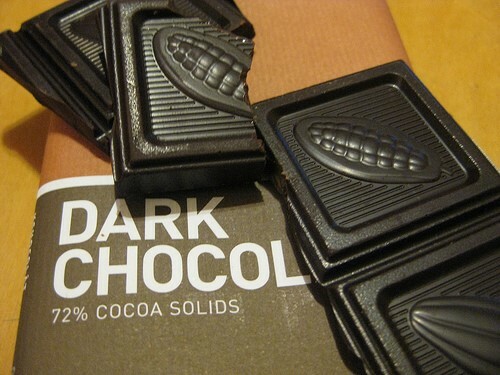 with dark chocolate containing high levels of tryptophan which is converted into serotonin, the “feel good” endorphin. Tryptophan also plays a part in helping to reduce cravings for sweet and starchy foods and so can help promote weight loss. And eating chocolate to aid weight loss sounds like everyone’s dream (!). Similarly, dark chocolate helps to ease PMT – not that any of the female of the species suffers from this, DO WE?!? Dark chocolate also contains small amounts of caffeine which helps to increase mental activity, alertness and resistance to fatigue. However at around 6mg per average sized bar – compared to 100 to 150 mg in a cup of coffee – it doesn’t quite have the same effect! And, finally, here’s a slightly bizarre one. The theobromine found in chocolate helps to relax and open up the airways in the Lungs, as well as acting on the Vagus Nerve. This can help relieve coughs; as well as neutralising free radical damage to the Lungs resulting from breathing in air borne pollutants. Well, as so often in the case, it’s all down to quality over quantity. True organic darker chocolate costs more, but you’ll find that a few squares – against a bar or two (!) – is all you’ll want at a time. Not only this, but you’ll find that you don’t crave a “chocolate fix” so often. And finally – apologies for this pun, we couldn’t resist it – you’ll find the bottom line becomes less of an issue!